After reading the article on the Ambulance Corps in the November 19 issue of the Weekly I’d like to comment on Advanced Life Support. Nothing wrong with the name, but calling it ALS has a bad connotation. To most people the letters ALS mean Amyotrophic Lateral Sclerosis, commonly referred to as Lou Gehrig’s disease. That was my first thought when I saw the headline. So maybe that’s just something for the Ambulance Corps to consider when calling it ALS. This entry was posted in admin and tagged ALS, Ambulance Corps, Letter to the editor on November 26, 2015 by Gina Greco. But I can’t help but wonder, where are the other six? This entry was posted in admin and tagged Poem, Thanksgiving on November 26, 2015 by betty Harwood. 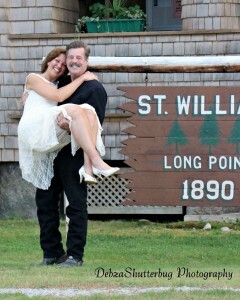 Surrounded by close family and friends, Mark A. Rhode and Linda W. Malfa of Odessa, FL were united in marriage in a quaint, intimate ceremony at the historic St. William’s Church on Long Point in Raquette Lake on Friday evening, September 25th. Mark and Linda’s children, Spencer Rhode, Colton Rhode, Carolyn Malfa and Laurie (Malfa) Rubin, witnessed the ceremony performed by Francis “Bear” Trichilo. This entry was posted in admin and tagged Wedding Announcement on November 26, 2015 by Gina Greco. While I typically devote my weekly column to the work of state government and the efforts of the New York State Senate to propose, craft and pass laws that would improve our lives, this week I wanted to take a momentary departure to observe one of the governmental roots of Thanksgiving. This entry was posted in admin and tagged James Seward on November 26, 2015 by James Seward. In last week’s article in the Weekly Adirondack, a brief mention was made about the Town of Webb Code & Zoning Office celebrating the 50th anniversary of its Zoning Ordinance. This entry was posted in admin and tagged Talkin' Code on November 26, 2015 by Andrew Getty. 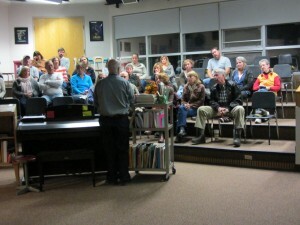 Approximately forty Town of Webb parents and community members attended an informational presentation about suicide risks, depression, and contributing aspects of brain development in young adults, on Tuesday, October 27 at the Town of Webb school’s vocal music room. This entry was posted in admin and tagged Suicide awareness, town of webb school on November 26, 2015 by Gina Greco.